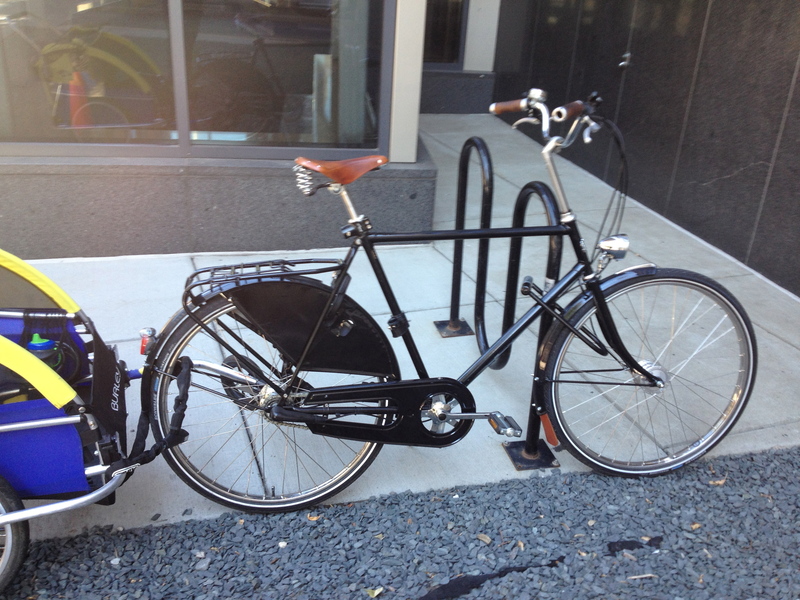 First off I saw this very Rakish Ride parked in downtown Minneapolis on Friday afternoon. 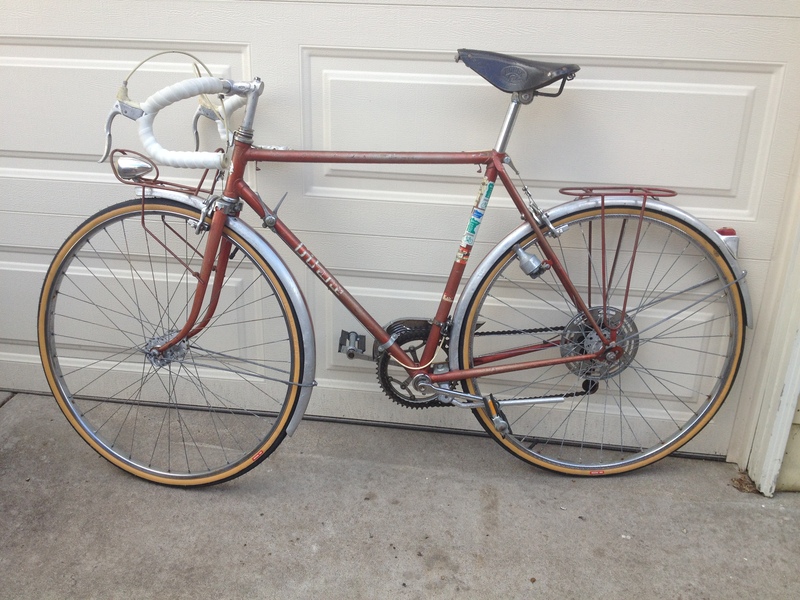 It appears to be a newer bike built up in the style of an Old Raleigh but it has some nice detail touches, most notably the Brooks leather saddle, the vintage style light and the cork grips. This is definately a family bike considering the Burley that is attached as well as the mount on the seat post to attach a trail behind bike for the older kid. The integrated rack and fenders, internal shifting rear hub, chain guard, etc…all make this a very nice commuter for the man about town. However, he might want to consider lowering those handlebars a bit. A quick note for those of you commuting by bike, I spotted a poster advertising a great deal for the Rakish (but safe) rider. 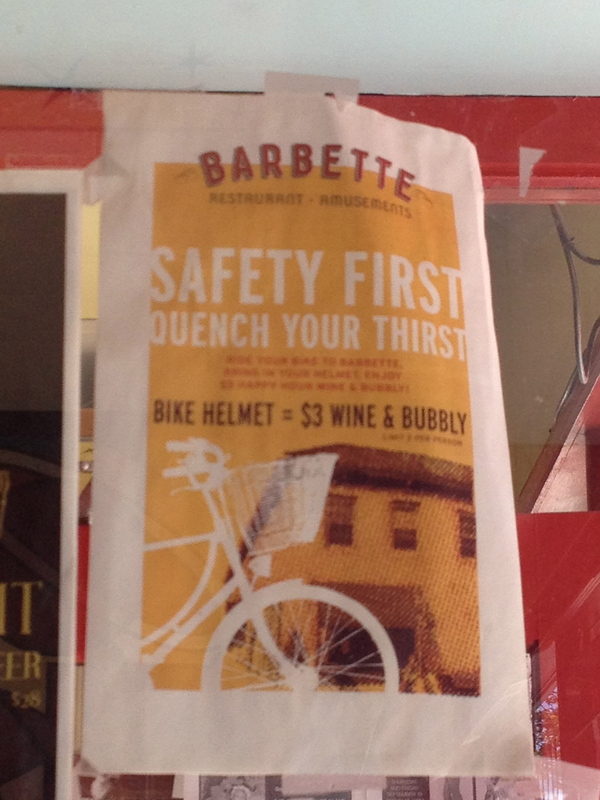 Barbette has great food. 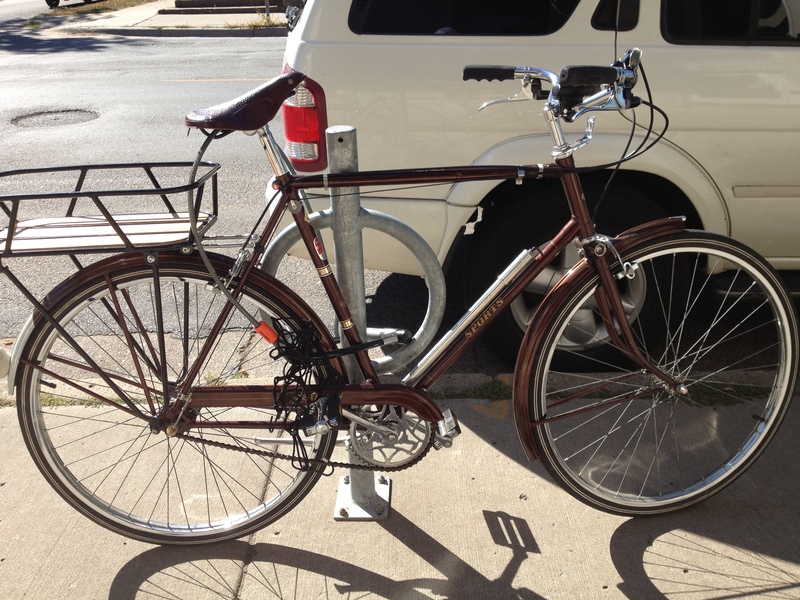 Our second Rakish Ride is a nice single speed/fixie, which I am not generally a big fan of since they are so common they are like the Ford Taurus of bikes here in Minneapolis. However this one has a great aesthetic and is a well executed build. 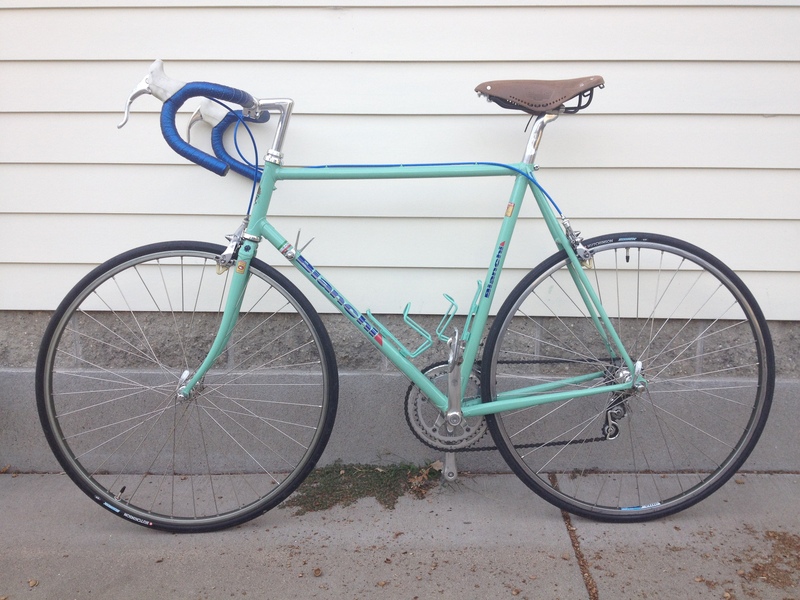 Using a classic 80’s lightweight Nishiki mixte frame and matching the wheels and seat to the decal colors is very Rakish. This next bike is a nice build based on a old Raleigh sport with a classic 70’s look, however, what’s up with the angle of that seat?!? Maybe a theft deterrence strategy?? Ouch..
Next Up is my Bianchi Suuperleggera, which I finished setting up this Saturday morning. I had to swap the bars with some wider Nitto’s, a new Brooks Aged Saddle and blue Fisik bar tape that suits this bike well. I also updated the brake cable housings to match the new cockpit color scheme. This is a much better and more classic look than the all Celeste scheme it had before and riding this bike is now an absolute joy. And finally there is my new project bike. A 1964 Gitane Hosteller in very good original condition. I found it on Craigslist and the seller was a kindred spirit bike and car guy named Andy who I talked with for about 40 minutes. I just love the original light touring setup of this thing and I immediately noticed some unique touches like the front rack being built around the shape of the light. I am going to use it for inspiration initially, as I build up touring bikes for Beth and I in advance of our European adventure this spring it will be nice to have this hanging on the garage wall this winter to give me an aesthetic reference point for the classic Randonneur. Depending on how much time I have I would like to get this and the Raleigh DL-1 that will hang next to it restored for next season. I will post regular updates on the progress of these two project bikes. Later this week I expect to receive a box containing the base for Beth’s touring bike, which I found in Colorado and am having packed up and shipped here by Gregory at Chocolate Spokes.